Inside the Outside is the second level of World 2 found in Yoshi's New Island. Yoshi starts the level in a nighttime grassy area with some enemies and a blue door nearby. 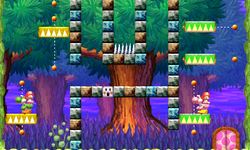 It leads to an area with a Fake Yoshi which can be tricked into falling onto spikes for a Smiley Flower to appear. A nearby door leads to the Checkpoint Ring and an Arrow Cloud which can be jumped on to propel Yoshi higher into the area. After clearing another Fake Yoshi puzzle, a pink door can be entered to reveal another Checkpoint Ring. After avoiding some more enemies, Yoshi reaches the Goal Ring. Sumgyeojin Gil'eul Chajaseo! Find the Hidden Path!